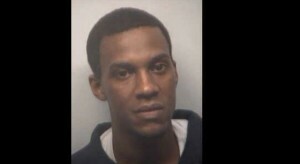 The man accused of killing Atlanta rapper Slim Dunkin turned himself in to police Monday. Vinson Hardimon, 28, also known as Young Vito, is being held at the Fulton County jail on murder and gun possession charges pending a bond hearing. According to witnesses, while at a video shoot in a Memorial Drive studio, Slim Dunkin, whose real name was Mario Hamilton, was shot in the chest on the evening of Dec. 16 during a fight that allegedly started over a piece of candy, police said. Sometime after 2 p.m., attorney Derrick Wright brought Hardimon to Atlanta Police headquarters, Quinn said. From there, Hardimon was taken to the Fulton jail. Quinn pointed out that Hardimon’s appearance had changed significantly after the shooting, comparing his picture in the wanted poster to the man who showed up Monday. “He cut off those dreadlocks and was clean-shaven,” Quinn said, pointing out a previous photo showed Hardimon with a dark goatee and mustache and long hair. Hardimon has been arrested at least four times in Fulton County dating back to 2004 on charges ranging from traffic violations to aggravated assault and child cruelty. Each arrest included charges for carrying a gun, whether illegally concealing weapons or using a firearm while committing a felony, according to jail records. Slim Dunkin was considered an up-and-comer in local rap star Waka Flaka Flame’s Brick Squad Monopoly hip hop collective. Investigators are still trying to piece together the facts behind the shooting, Quinn said. Police are asking that anyone with information in the case call Crime Stoppers Atlanta at 404-577-8477 or contact Quinn at 404-245-8039.